Heat oil in a frying pan and saute onion,red chillies,green chillies,mint and coriander till onion becomes soft. Allow it to cool and then coarsely grind. 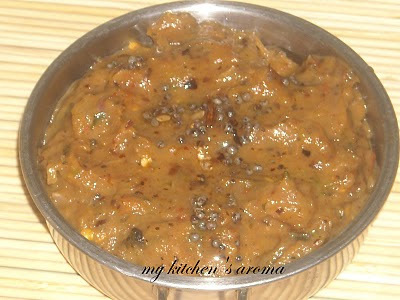 This chutney can be served with idly and dosa.And also this chutney can be spread on dosa. Adding mints would have given more flavour na...delicious chutney, goes amazing with hot idlis..
Really spicy & hot chutney! Perfect with dosa! yumm, simplicity at it's best. Wow that chutney looks so so delcious. This looks really spicy & tempting. YUM YUM! Looks tasty, must make it for Dosa. Ur chutney is surely luking very spicy...nice one. mmm, a wonderful chutney goes well with dosa and idly... nice color!!! Saritha, I love the chutney! Feel like making it today. Hey Saritha, how u doing???? Am back after a long time. That's a wonderful chutney yaa! chutney looks very delicious and so easy to make!